They've got lots of theories, just not a lot of hard evidence. Space may be the final frontier, but we've barely begun to explore its underlying mechanics. For as much as humanity has discovered since we first looked to the heavens, we've only seen about five percent of the total matter in the universe. The other 95 percent -- the so-called "dark matter" -- well, we can't even figure out how to see yet. But that doesn't mean researchers from around the world aren't devising ways to do so. The search for dark matter began in earnest back in the 17th century, shortly after Isaac Newton released his theory of universal gravity, when astronomers posited that some celestial objects might not emit light but could still be observed based on their gravitational effects (i.e. black holes). Over the past few decades, thanks to advances in optical and radio astronomy technologies, evidence for the existence of dark matter has continued to mount. At this point, astronomers believe dark matter constitutes about 27 percent of the universe's total mass (and nearly 95 percent if you include dark energy as well). While the scientific community is now certain that dark matter exists, there's no consensus as to what the stuff is actually made of. There are two leading theories right now. One argues that dark matter is made of Weakly Interacting Massive Particles (WIMPs) -- theorized to have a mass 100,000 times greater than an electron (and therefore behave as conventional particles). The other speculates it's made of axions, elementary particles with a mass a hundred-billionths that of an electron (and that behave as waves). Axions are thought to exert the same Wave-Particle Duality that photons do, just without our ability to observe them directly. "If dark matter was some new particle, there's really only a couple of ways that it can interact with us," Dr. Philipp Schuster, associate professor at the SLAC National Accelerator Laboratory, told Engadget. "One possibility is that it could be a particle that's actually charged under familiar forces [i.e. WIMPs]. And the other the possibility is that it could just be a particle that's not charged under standard model forces but nonetheless have it its own force. "In that case, it could interact and through a new vector particle, basically for something akin to electromagnetism," he continued, "or it could interact with us through something that actually doesn't have an analog in nature." In order to determine what these dark matter particles are made of, researchers devised a number of experiments. These studies can be divided into three general categories: particle detectors should dark matter be made of WIMPs, wave effect detectors if dark matter is actually axions (aka dark photons), and astronomical surveys that study the effects of dark matter on the observable universe, specifically, gravitational lensing. If dark matter is made of WIMPs, we'll likely discover it with enormous tubs of liquid xenon stored deep beneath the Earth's surface. Because WIMPs, as their name implies, don't readily interact with known matter, detecting them is a tricky process. Anything radioactive -- from cosmic background radiation to the trace amounts of uranium in soil -- can return a false positive reading. The XENON1T study, for example, is buried deep within a mountain underneath the Gran Sasso National Laboratory in Italy. Every piece of equipment it uses has been hand-crafted from super radio-pure stainless steel, Rafael Lang, associate professor of physics and astronomy at Purdue University, told Engadget. Its one-ton vat of liquid xenon is among the purest on Earth, with just one part per trillion (PPT) of krypton contamination -- orders of magnitude lower than what's found in nature. In fact, the XENON1T is the most sensitive (read: least radioactive) WIMP detector built to date. "What we do is we take a bucket, we fill it up with liquid xenon and we sit and wait until a particle hits the liquid xenon," Lang explained. 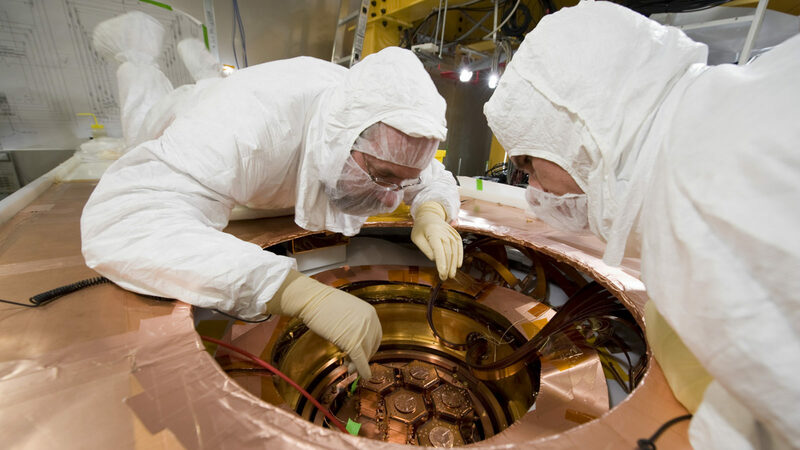 The device's primary detector, the Liquid Xenon Time Projection Chamber (LXeTPC), sits in the cryogenically-cooled xenon, itself surrounded by a larger tub of purified water to further shield it from radiation. The idea is that, with all this shielding, the only stuff that will make it through will be WIMPs. And, should a WIMP manage to strike one of the xenon nuclei, the impact will cause the liquid to scintillate -- that is, create a flash of visible light -- that the LXeTPC will detect. The LUX-ZEPLIN experiment being conducted in South Dakota by the Lawrence Berkeley National Lab is also looking for WIMPS. "The basic idea is we're building a super fancy Geiger counter to try to detect this one particular type of event," Dr. Daniel Akerib, professor of particle physics and astrophysics at Stanford University, told Engadget. The XENON1T and LUX-ZEPLIN experiments aren't the only subterranean devices looking for WIMPs. As part of its Cryogenic Dark Matter Search (CDMS), the US Department of Energy is working with SLAC to build out the SNOLAB, a dark matter detector located two kilometers below ground at Vale's Creighton nickel mine in Ontario. Once SNOLAB comes online in 2018, it's expected to be ten times more sensitive than the current CDMS experiment being conducted 2,340 feet below ground at University of Minnesota's Soudan Underground Laboratory. "We're not only going to be able see lower-mass particles, but we're also going to be much more sensitive than ever before," SLAC senior staff scientist Richard Partridge said in a statement. "This is a huge challenge, one that requires much R&D, very careful fabrication, and high-precision testing. SLAC has a big role in all this, but we're also working closely with many other institutions." Lang, for one, welcomes the competition. "It helps, it helps greatly," he exclaimed. "There's a big need to try out all kinds of crazy different ideas that you can come up with." These experiments' current failure to positively identify an interaction between WIMPs and xenon nuclei may be due to the theoretical particle's weakly interacting nature, or it may be because researchers are simply looking for the wrong thing. If dark matter isn't made of massive particles, but light ones such as axions, detectors like the LUX-ZEPLIN or XENON1T won't see them. But the Dark Matter Radio, Fermilab's ADMX, or the APEX experiments just might. "If the dark matter is built out of a spinless particle that is sufficiently light, then it actually behaves much more like something like an electromagnetic wave than a particle," Schuster explained. And by sufficiently light, he means "a billionth the mass of an electron." "What that means is that there's a lot more of it. There's a lot more particles in order to make up the dark matter of the galaxy," Dr. Peter Graham, associate professor of physics at Stanford, told Engadget. "And what that also means is that you don't, for example, look to see an individual ping from an individual axion on it in your experiments. It's just it's just way too little energy." Just as a single drop of water can't cut through bedrock while a river can, researchers have to look for axions behaving en mass. To do so, we just have to find their resonant frequency. The Dark Matter Radio experiment out of Stanford University, for example, operates much like a terrestrial radio, just on a cosmic scale. The radio is akin to a basic LC circuit (read: an electronic oscillator) "looking at the hundreds of megahertz or megahertz even down to maybe kilohertz, we're looking at a broad range," Graham said. This setup provides unique challenges compared to particle detectors. For one, the radio does not have to be buried deep underground to avoid interference from cosmic rays. It does, however, have to be encased in a conducting box to effectively screen out background radio noise. What's more, while particle detectors are turned on and left to run for a year at a time, these radios can cycle through its various frequencies every 10 to 15 minutes. Once researchers do find the resonant frequency, they'll be able to immediately calculate the individual axion mass. "Because we know it's basically nonrelativistic, we know the frequency is equal to the mass of the axion," Graham explained. Whether dark matter is comprised of WIMPs or axions makes a big difference in our understanding of the universe's mechanics. "Dark matter could just be built out of hidden photons (aka axions)," Schuster said. "That would basically mean that not only is there a new force out there, but the remnants of that force -- the particle carriers -- have a high enough density in the universe that it actually is producing dark matter. I think that would actually surprise the field quite considerably." Should this turn out to be the case, researchers will have discovered a new fundamental force -- the 21st-century equivalent to electromagnetism. "The other possibility, of course, is that dark matter could be built out of an existing particle but it could be charged under a new force, that its photons are the mediator particle," Schuster continued. "That possibility is very similar to the WIMP idea, but it's just it's different in that the particle is not charged under [a known] force, they're charged under a new force, the hidden photon being the mediator." Some astronomers are taking a more direct approach and searching for evidence of dark matter using the cosmos. 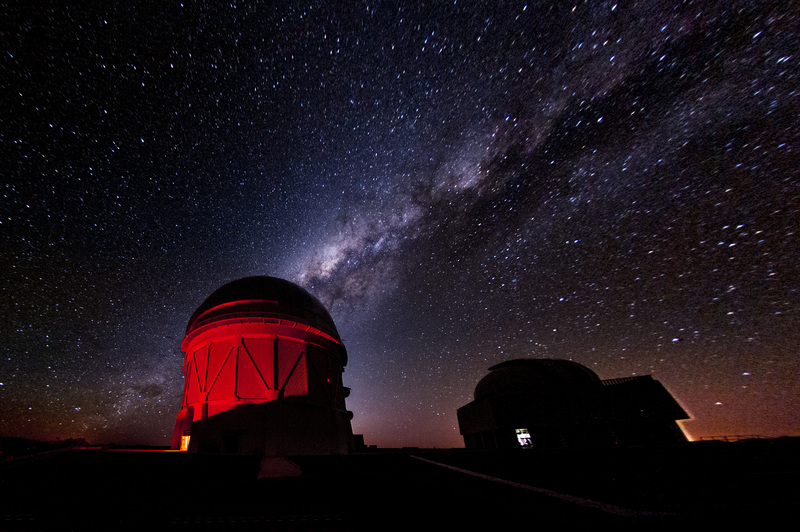 Astronomers with the Large Synoptic Survey Telescope, which will be coming online in 2021, and the Dark Energy Survey, which is has been collecting data at the Cerro Tololo Inter-American Observatory in Chile since 2013, hope that gravitational lensing might hold the key to observing dark matter directly. Well, as directly as a weakly interacting fundamental particle can be observed. These surveys hope to observe dark matter much in the same way that we search for black holes: by looking for the light that they deform. "If you put a mass concentration in front of some distant object you're looking at then the light coming from that distant object will come around that mass, the rays will be diverted and you'll get a distorted image," Dr. Steve Kahn, professor of physics at SLAC and the head of the LSST project, told Engadget. Both the DES and the LSST can and will exploit this effect to potentially find clumps of dark matter in space. "Correlations in the distortion of galaxies which are near each other in the sky will appear distorted in similar ways..." Kahn said. "So this lensing effect is a way of literally seeing dark matter. The dark matter is invisible but we can infer its existence and its distribution of lensing in the background images of the galaxy." This technique will also help us calculate how far away these mass concentrations are due to their Doppler redshift. Just as the sirens of an ambulance rise in frequency as the vehicle approaches you but then drop as it passes, the photonic frequency appears more blue if the light source is approaching you and shifts to red if the source is moving away. At this point, however, humanity's journey to discover the secrets of the universe has barely begun. "It would just be very, very surprising if the if the bulk of what's leftover is, you know, some simple single particle with no interesting interactions," Schuster concluded. "I think a much more likely possibility is that there are many more forces, many more new interactions, that are related to dark matter. We just need to figure out what it is."